Having lived outside of Yellowstone for almost 25 years, I had the opportunity to spend many a day in the Park observing wildlife while enjoying and appreciating nature. I can vouch firsthand that winters in Yellowstone can be very harsh, and while we all look amazed at how brutal nature can be, especially the record November snowfall in Buffalo, New York, buffalo in Yellowstone face winters much more extreme. Slowly snaking a snowmobile past a herd of bison gathered on a snow-filled path, geysers in the background, smoking in the minus 40 degree conditions, feeling the breath of the collective herd from their ice-covered faces — this is an experience not soon forgotten. “If the bald eagle is our nation’s symbol—majestic and free—then the bison is surely our nation’s soul,” says Marty Levinson. Our humble Gazette publication was founded with certain goals in mind: a thirst for the truth — no matter where that takes us, transparency, and giving voice to those who very often are ignored because their thoughts and ideas are not deemed mainstream or popular. 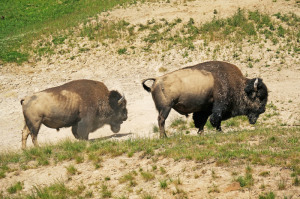 We are determined, like the bison, to rout out corruption wherever it is found, expose abuses within our court systems, and keep elected officials (i.e., public servants) accountable to the oaths they’ve taken. And, like the buffalo, we will remain protective of a free and independent press, for a free and independent people, like readers such as yourselves. 1. Realize that we are in this together. Draw strength from others. Bison herds range in size and are ordered in an intricate structure. Members form strong bonds with each other. 2. Let the women lead, they know where they are going. Family groups are matriarchal; an adult cow leads when groups travel together. Offspring may remain with mom for as long as three years after birth. 4. You are your brother’s keeper. Unite for the greater good. When threatened, bison form a tight circle. Calves go in the center of the circle. 6. Persevere in the face of difficulty. You have what it takes. 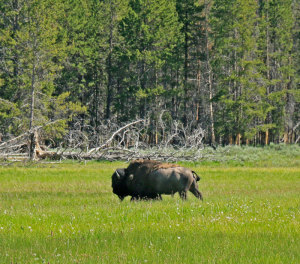 Yellowstone bison spend long, harsh winters plowing through snow. The muscular hump is structural, and helps support the huge head, which is used to sweep snow aside in search of frozen vegetation. 7. Pay attention to good grooming. Bison groom frequently, rubbing against trees to remove loose fur, and frequently take dust baths. 8. Stay active. Size is no excuse; even the largest of us can be active. Although bison, the largest North American land mammal, can weigh 2000 pounds, they can run 30 mph and can swim rivers over half a mile long. 9. Foster curiosity, travel. Expand your range. Sometimes other grass is greener. Bison are both curious and migratory creatures who travel long distances along traditional routes as food availability changes with the seasons. Bison are gregarious, social creatures. At one month old, calves form play groups. 11. Let it all hang out. Express your feelings, reveal your emotions. A bison’s tale tells it all. Hanging down and switching casually, a bison is at ease; extending out and drooping at the end, she is mildly agitated; extended straight up, he is ready to charge. 12. Care for your home, the Earth. Leave it better than you found it. 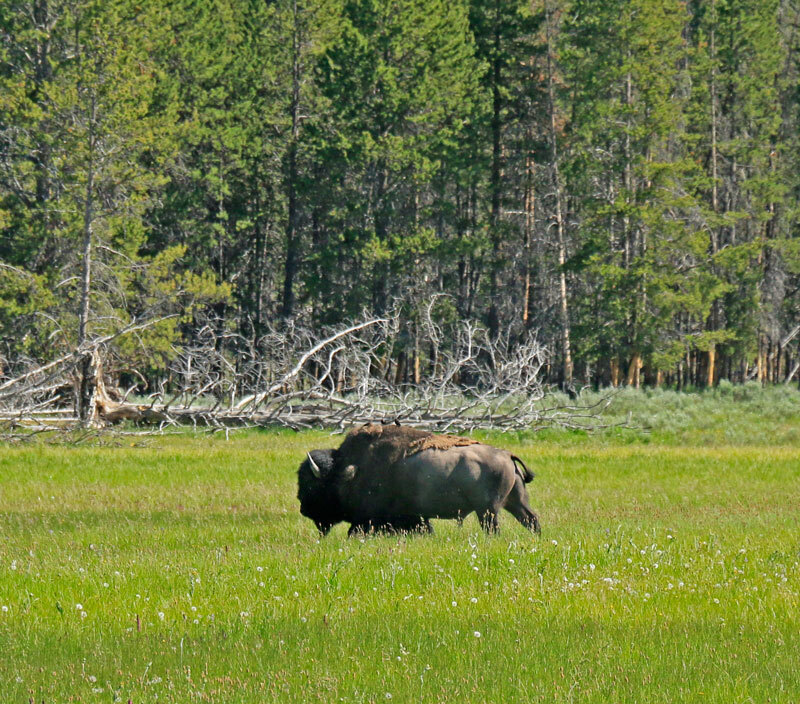 Bison move cautiously as they feed, rarely overgrazing an area, unlike cattle. Their hooves till and compact the soil, to which they add beneficial fertilizer. 13. Leave your mark on the world. Since arriving in North America during the Ice Age, bison have had a greater impact on the landscape than any other species. Ranging from Alaska to Mexico, they were the only large herbivore to successfully make the transition from Ice Age to warmer, drier climates.